Normal Mode is one of the two modes and the first to be encountered on the Campaign Map. Initiating a battle costs 1 energy unit. Starting with the sixth island, wave battles will be occasionally encountered. In these battles, the Trainers must defeat two different sets of Dragons in order to win the quest. Hiring Dragons is permitted for all battles, except for the very last island. Progressing on the map the Trainer follows a storyline in Normal Mode, whereas the Heroic Mode features no dialogues. The mastery skill of each rival Dragon's corresponding Element is noted with 6 if it is one of Hot Coals, Storm's A-Brewin', Stone Cold, Restorative Recourse, Infection, En Garde!, Burnout, Pay it Forward, Dazzling Aura, Frightened Speechless, Heroic Healing, or Great Blessing, and 7 if it is one of Slow Burn, Last Breath, Tombstone, Regeneration, Pandemic, Final Vengeance, Power of Thunder, Dark Ritual, Healing Light, Shade of Oneself, Heroic Duel, or Mass Blessing. The rewards given for defeating quests are the ones displayed below, but in the game they are usually rounded to the nearest value of 100 or 500. 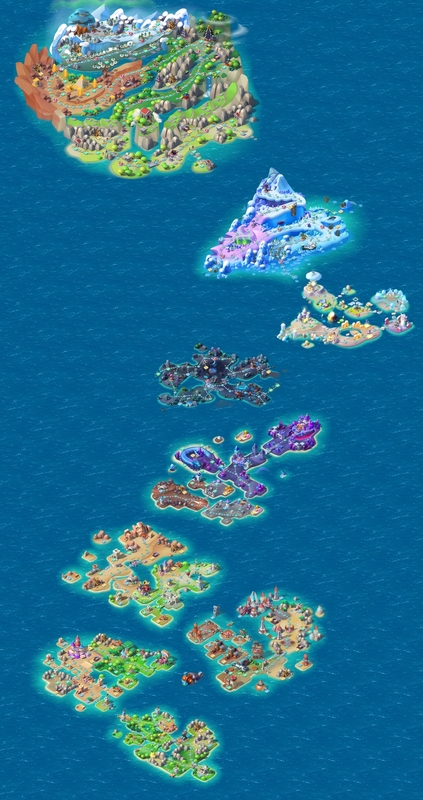 Main Quests travel along a path through each island and each quest must be completed in order to advance forward in the Normal Mode of the Campaign Map. Beating Quest 205 rewards the Trainer the Adventurer Badge while beating Quest 295 rewards the Herbalist Dragon and the Conqueror Badge. The rewards shown below are those given for beating the quest with three stars in one attempt for the very first time. A Scroll will be given only once if the quest is beaten with three stars, either in one or more attempts. Side Quests are repeatable quests that branch off of the main path. Side Quests can only be reached after clearing the quest which it is attached to and, where needed, by unlocking the Rusty Gate that leads to it. After some or all of the available Side Quests have been beaten, a limited number of these quests will refresh automatically at a random interval between 5 and 7 hours. Rewards are set when the Side Quest(s) become(s) active again and they are 30% of the total rewards which one would get on their latest progress step in Normal Mode. In other words, the further the Trainer is in Normal Mode, the higher the rewards of the Side Quests will be. The rewards given and the Dragons encountered the very first time a Side Quest is fought, as well as their levels and skills, are the same for everyone. Starting with the first refresh, the opposing Dragons vary over time and are generated randomly while their levels get adjusted based on the levels of the Trainer's Dragons. The table below lists only the Dragons that are encountered the very first time in this mode. Requirements marked with a icon indicate the Side Quest is behind a gate, thus, even if the quest needed to unlock the Side Quest is beaten, the gate indicated in parentheses needs to be opened before the Side Quest can be attempted. Aside from being rewarded after winning battles, chests are also sometimes given outside battles after certain quests have been beaten or certain gates have been opened. Upon opening a chest, it will offer one of Food, Gold or Gems at random. The amount of Food or Gold is based on the level of the Trainer while the amount of Gems is always 1. Rusty Gates are places on the map that can be unlocked either with the help of friends, or by spending 5 Gems per slot. Certain Side Quests and mines can only be accessed by opening these gates. There are 31 Rusty Gates in Normal Mode. Each gate can be unlocked after beating the quest it is attached to. Once a gate is opened, it will remain open. Mines provide a regular source of Gold while controlled. These are unlocked while advancing through the Normal Mode and can only be reached after clearing the quest which it is attached to and, where needed, by unlocking the Rusty Gate that leads to it. There are 37 mines in total. Mines will be retaken by the enemy characters after a minimum of 48 hours and must be successfully defended to maintain a claim upon them. The rewards given and the Dragons encountered the very first time a mine is fought, as well as their levels and skills, are the same for everyone. Starting with the first refresh, the opposing Dragons vary over time and are generated randomly while their levels get adjusted based on the levels of the Trainer's Dragons. The table below lists only the Dragons that are encountered the very first time. The total Gold capacity of all mines combined is 850,800 . The rewards shown below are those given for conquering the mine with 3 stars in one attempt. A Scroll will only be given if the mine is conquered with 3 stars within the first try. After mines are retaken, reconquering them will no longer result in Scrolls or Food, only in Gold and experience points. Requirements marked with indicate the mine is behind a gate, thus, even if the quest needed to unlock the mine is beaten, the gate indicated in parentheses needs to be opened before the mine can be conquered.